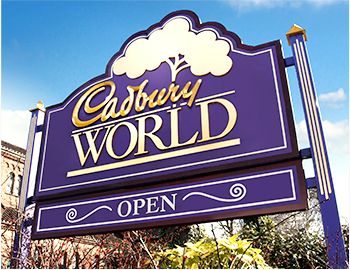 Enjoy a scrumptious day out that's choc-full of festive fun this Christmas at Cadbury World! Discover our chocolatey zones and whole host of seasonal activities for all the family, every Saturday and Sunday from 16th November till 15th December... PLUS 20th, 21st, 22nd and 23rd December! Tickets include entry to the pantomime and a visit to see Santa in his exclusive stage show! Pre-book your tickets for the Christmas Celebration dates to guarantee entry online here or over the phone on +44 121 393 6004. See Santa in his exclusive stage show! A festive day out wouldn't be complete without seeing the jolly man himself! Now the star of his very own stage show, the Santa experience is packed full of festive fun and music the whole family can enjoy. Laden with Christmas gifts for his elves to hand out to visiting children, the exclusive Cadbury World Santa Show is not to be missed. Please book your Santa Show slot at least 30 minutes prior to or 2 hours after your Cadbury World exhibition tour time. Each year we are delighted to be able to include a brand new pantomime in our festive lineup. As well as a visit to see the jolly man himself, your family will be able to enjoy our very own panto. A world of interactive fun with a chocolatey twist awaits! Enjoy traditional festive fayre with a Christmas menu at the Cadbury Café. 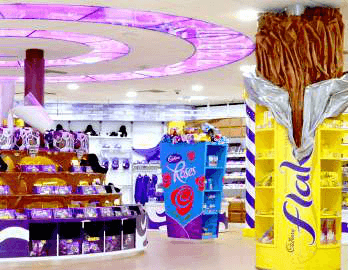 Shop for all your favourite festive chocolates, courtesy of The World's Biggest Cadbury Shop. A whole world choc-full of fun! 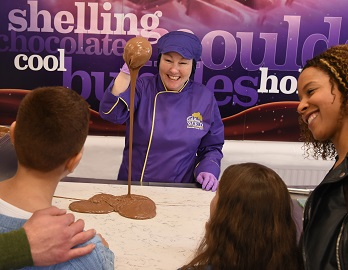 Learn how your favourite confectionery is made, play in chocolate rain and add your favourite treat to a pot of delicious warm liquid Cadbury Dairy Milk. Discover the origins or the cocoa bean amidst trees and waterfalls in the Aztec Jungle, before riding the Crunchie rollercoaster in our unique cinema experience, the 4D Chocolate Adventure. Book your visit to Cadbury World + Christmas Celebrations here.